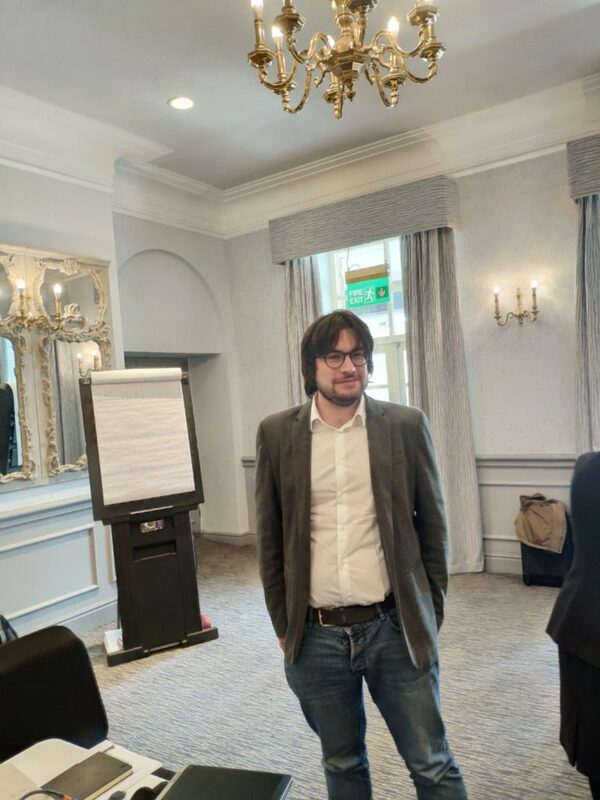 The 4th Technical WorkShop organized by UK VLN took place on the 7th-9th of April 2019 at Shrigley Hall, Cheshire. This event is organized in order to give to the network members the opportunity to present their research, exchange ideas and promote the vertical lift research sector. 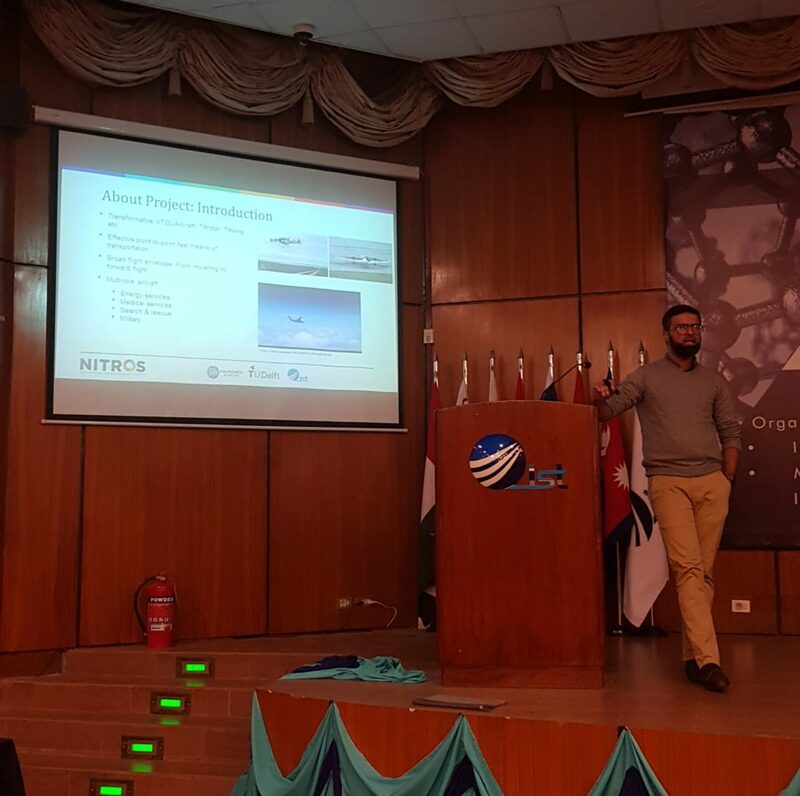 During one of the sessions of the Workshop, ESR #08 Federico Rovere, introduced the NITROS project and his work about Modelling of Brown-out/White-out to the attendants. Federico gave a brief introduction about the literature survey carried out so far, pointing out how Brown-out and White-out afflict helicopter safety. The presentation included also the work done so far for the prediction the rotorcraft wake using CFD (Computational Fluid Dynamics): an accurate simulation of the rotor wake features is fundamental in order to predict properly the particle dispersion in the helicopter environment in case of Brown-out or White-out. This video presents some general concepts of pilot induced oscillation (PIO), including the classification of PIO, examples of Aircraft pilot coupling (APC) and Rotorcraft pilot coupling (RPC). Description of Cat. III PIO and potential trigger events of Cat. III PIO is presented as well. Finally, the Flight simulation facilities that will be used in the following research is shown in the video. The video presents the first test campaign performed at Large Wind Tunnel of Politecnico di Milano of Ship Helicopter Airwake interactions. Helicopters are some of the most flexible aircraft in existence, their ability to freely manoeuvre in almost any direction allows their employment in missions that no other vehicle can perform. Search and rescue missions between mountains or buildings, logistic support to remote offshore installations and naval operations from military vessels are only a few examples of the very diverse applications of helicopters. Many of these missions require pilots to fly in very challenging environments, often under the airwake and turbulence shed by very close obstacles, for example the ship superstructure during deck landings. Sudden changes in the wind velocity surrounding the helicopter will result in upsets in the aircraft position, orientation and speed that can impair handling by the pilot or even lead to loss of control. Improving our understanding of these hazards is a requirement to achieve NITROS objective of enhancing helicopter safety. Flight simulation is proving to be a very valuable tool for this aim. Most people are familiar with the use of flight simulation for training, allowing pilots to virtually practise a task in order to prepare for real world flight training. But piloted and unmanned flight simulation (also known as online and offline flight simulation respectively) also has important applications in research and development. For example, wind energy is proliferating across the globe with wind farms appearing near airfields and heliports, there are increasing risk for an encounter with the airwake of a wind turbine. There is almost no experimental data for these kind of scenarios  but flight simulation can be used in initial concept studies for operations, helping engineers to identify possible risks beforehand and to prepare flight test. Also if flight simulators can reproduce the underlying physical causes of such hazards, they might help in evaluating possible solutions before putting them into practice. 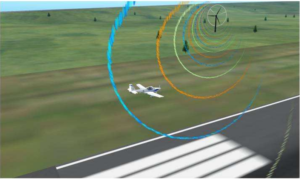 This was the objective of a series of tests  conducted at the University of Liverpool during which pilots flew a simulated accidental encounter between a general aviation airplane and the airwake of a small wind turbine. It was shown that the airwake of a wind turbine could lead to mild upsets in aircraft attitudes which should not impair handling. Encounters with the airwake of modern very large wind turbines might produce a different outcome however. Also, due to their very different flight mechanics and handling, helicopters will probably react in a very different way than fixed wing aircraft. Since they are being used to provide logistical support to offshore wind energy installations  and might need to operate in their vicinity for search and rescue missions, knowing the effects of such an encounter is therefore of great interest . But if flight simulators are to be useful in reducing the hazards from airwake encounters they must realistically reproduce their effects and for piloted flight simulation, it must do so in real time. This is no easy requirement. The simulator combines mathematical models that describe the behaviour of the aircraft and the aerodynamics of their environment and solves them together to determine how the aircraft behaves. The accuracy of models and their coupling, as well as the obtained results, must be validated. Comparison against results of wind tunnel experiments, field measurements and flight tests as well as pilot feedback can be used to assess if a model is valid. Usually improvements in accuracy are obtained by including the effect of additional physical phenomena to the model. But this comes at the cost of increasing complexity leading to longer computation times, as solving these models, especially the fluid dynamics equations that describe the behaviour of the airwake, requires a large number of calculations which have to be performed repeatedly. This would have been completely impossible without today’s computing technology. But even then, if flight simulation is to be feasible, simplifications in models or coupling must be found that still lead to accurate results. An example of such a coupling of different models is being applied to train naval pilots in ship deck landings. 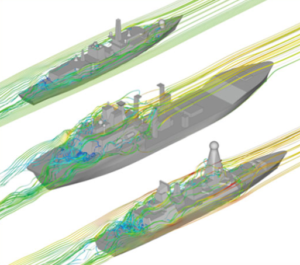 The ship airwake is solved using computational fluid dynamics, and approach that can last between hours or days depending on the fidelity of the solution. The movement of the air over the ship deck is stored as if it were a movie and replayed in the flight simulator which then can calculate the effects of the airwake on the helicopter in real time. This approach produces very realistic airwakes when compared to experimental measurements and has shown to help in the preparation of flight trials and training of pilots by providing them with a first impression of how to approach the landing. This is referred as one way coupling. The effects of the airwake on the helicopter are modelled very accurately, but not so the effects of the helicopter on the airwake, since the solution of the airwake has been computed and stored beforehand. If the airwake changes due to the presence of the helicopter, their effects on the helicopter might change too. Complete coupling of aerodynamics and flight dynamics would require computing the aerodynamics of the airwake and the helicopter acting upon it, computing its effects on the movement of the helicopter and applying them and then starting the cycle again for the new position and orientation of the aircraft. With the computational technologies available today, it is impossible to perform these simulations fast enough for piloted simulations. Research is being conducted in this regard for non-piloted flight simulation. Here the pilot is replaced by an automatic pilot model that emulates a human pilot attempting to perform the intended task. But future improvements in modelling techniques and computing technologies might allow to implement some of these methodologies to improve the accuracy of piloted flight simulation. As we have seen, whenever models are being used to obtain predictions, care has to be taken in their evaluation and researcher and engineers must always be aware of the limitations and compromises of the methodology applied. But results obtained by flight simulation can help pilots to prepare for flight training and provide guidance to engineers to evaluate new designs, alert about possible risks and identify which conditions require further testing. Used correctly, flight simulators can lower costs and enhance safety by reducing required flight hours for testing and training and by allowing to better prepare for them beforehand. A great help in achieving NITROS objective of enhancing helicopter safety. Y. Wang, M. White, and G. N. Barakos, “Wind Turbine Wake Encounter Study,” 2015. R. Roorman, “Assessing Viability in Offshore Wind,” Rotor and Wind, 2018. 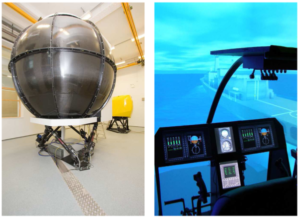 I. Owen, M. D. White, G. D. Padfield, and S. J. Hodge, “A virtual engineering approach to the ship-helicopter dynamic interface – A decade of modelling and simulation research at the University of Liverpool,” Aeronaut. J., vol. 121, no. 1246, pp. 1833–1857, 2017. From first successful flight by Wright brothers to Airbus A380, and from first flight of Sikorsky’s VS-300 to Boeing’s AH-64 Apache, the aerospace industry has made huge advances in both fixed-wing and rotary-wing aircraft. Fixed wing allows an airplane to fly by generating lift through vehicle’s forward airspeed. On the other hand, helicopters do not need the vehicle’s forward speed; the lift is generated by the spinning rotary wings. Helicopters have the ability to vertically takeoff and land that allows them to takeoff and land virtually anywhere and access remote areas, however, it has limited capability in speed and range when compared to a conventional fixed-wing airplane. The ambition to combine best of both worlds i.e., an aircraft that has VTOL (Vertical Takeoff and Landing) capability of a helicopter, and speed and range of a fixed-wing airplane, led to the development of several hybrid configurations. Tiltrotor is one such example and is the only rotary convertiplane in service. Tiltrotors are the ultimate transformers, because not only they transform from one configuration to another during flight, they are also transforming the future of aviation industry. Most of the modern transformative VTOL aircraft, such as Uber Elevate, Lilium jet, Vahana from A3 by Airbus, Project zero by Leonardo helicopters, are inspired by tiltrotors in one way or another. The hybrid configuration of these transformative VTOL aircraft allows them to operate over a broad flight envelope and thus present a lot of opportunities. The ability to hover like a helicopter and at the same time to fly at relatively high cruise speeds and range make them an effective point-to-point fast means of transportations. Their multi-role capability not only make them ideal for urban air mobility but also for energy & medical services and search & rescue missions. However, the multi-role capability with large flight envelope pose various technical challenges in designing an aircraft to perform adequately over a wide range of aircraft configurations. These technical challenges include: dramatic change in control strategies with flight conditions and aircraft configurations, Rotorcraft Pilot Coupling (RPC) and structural loads. In conclusion, the modern rotary VTOL aircraft will be half airplane and half helicopter that will fly long distances at higher speeds. In order to ensure safety and take full advantage of the hybrid capabilities of future transformative VTOL aircraft, various technical challenges need to be addressed at the design phase of the aircraft. It happens to everyone that in some conditions of loading to your body, the body couldn’t tolerate the situation and it will be injured. Body of older persons or individuals with a previous injury are more vulnerable and they are at greater risk of injury. So how you realize that your body is in danger? The nervous system that is distributed all over the body will recognize the pain and brings all the data to the brain and then after analyzing the data your brain finds out what has happened to the body and will decide the next step and will trigger an immediate command before the failure of the body. For example, if body experiences pain inside the knee and this pain signal becomes amplified, the next step is to sit, otherwise it could cause the body to fall down. Now consider that helicopter structure could sense what is going to happen like human body and could make decision before a complete failure. It means that the structure could sense if it has been strained to the point of damage and could reduce its load-carrying capacity, then report that information in real time before the structure’s safety is compromised or in the case of propagation of damage, pilots will be informed how much time he has left for landing. For many years, such a scenario was more like the stuff of science fiction than fact, but today, structural health monitoring (SHM) systems that can perform these tasks are closer to reality. The damage tolerance and high strength-to-weight ratio of composites have motivated designers to expand the role of advanced materials in aircraft structures. This practice, however, further complicates inspection of flaws before it causes critical situation. As a result, the aviation industry has recognized the need for more sophisticated and more innovative ways to deploy them in situations where complex structural geometries create accessibility limitations that may impede efforts to locate and identify deeply hidden flaws. “The basic idea of SHM is to build a system similar to the human nervous system, with a network of sensors placed in critical areas where structural integrity must be maintained” says Holger Speckmann, who is the Co-Founder of the SHM-AISC (SHM – Aerospace Industry Steering Committee) (Bremen, Germany) . In general, SHM is a method of integrity analysis of an object via real-time measurements of a set of parameters, which characterize the object’s integrity . The main assignment of SHM system is to alert system operator in case of critical structure situation such as fibre strains or breakage and matrix cracks. The other benefit of damage detection is reduction in the cost of maintenance. Operation and maintenance which can account for more than half of a rotorcraft’s total cost, but health monitoring can reduce those maintenance costs by more than 15% and reduce unscheduled downtime by nearly 50%. The most common measurement quantity which is used to detect the presence of damage is strain. Devices used for this measurement are commonly referred to as ‘sensors’, measuring a value linearly proportional to a quantity of interest such as deformation. Currently, most sensors employed in SHM systems are either optical fibres or piezoelectric devices . Practically, fibre optic sensors form the most useful class of sensors for SHM systems. Employing an embedded FBG sensors for measurement of distributed stress and strain fields of the composite material has significant advantages. First of all, FBG sensors can be easily embedded into materials to provide damage detection or internal strain field mapping. The FBG sensors supposed to be located in fiber optic cable mounted in the sample. Furthermore, the key feature of FBGs sensors is that the information about perturbations is encoded in wavelength. Indeed, this type of sensor has fantastic compatibility with composite . Although SHM is still immature, research and development has already yielded promising results. It will be hoped that in the near future this system could prevent all the accidents cause by structural failure and help to reduce the cost and time of maintenance. Cockpit of the AgustaWestland 139 helicopter, by user Jet Request [CC BY-SA 3.0 (https://creativecommons.org/licenses/by-sa/3.0)], from Wikimedia Commons. Piloting a helicopter is not an easy task. 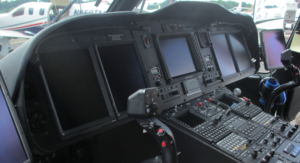 To support the pilot, automated systems like stability augmentation systems, autopilot systems or flight management systems have been developed and used in the aviation domain. While these systems can be a great asset, many issues and potential pitfalls must be considered during their development and design process. This blog post briefly describes some of the more widely known issues with these systems, called “Ironies of Automation”. The so-called “Ironies of Automation”, as introduced by Lisanne Bainbridge in 1983, describe pitfalls of introducing automation into human control tasks. Originating in the industrial process control domain, the discussed ironies are also applicable to the generalized case of a (complex) technical system being controlled by a human operator. Bainbridge’s paper details a number of problems which arise by reallocating control responsibilities from the human operator to automated systems. I want to highlight some of the ironies of automation that must be considered when developing and evaluating helicopter automated systems. It is based on Bainbridge’s original paper . Reviews of the current state of these problems are available for example in  or . There exist more issues, beside these ironies, that must be considered while designing or evaluating automated systems, which are outside of the scope of this short blog post – interface design principles, which metrics should be used for system evaluation, or additional automation issues like opaqueness and brittleness. Often, automated systems are designed for a certain task and specific conditions. While the automation controls the system directly, the human’s task is to monitor the actions of the automation. In case of unanticipated automation or system behaviour, or unanticipated external conditions, the human operator is supposed to take control from the automation and control the system manually/directly, or in a state of reduced automation capabilities. The human operator’s task is no longer predominantly a manual control task, but a supervisory control task. This kind of responsibility allocation leads to several problems. “Physical skills deteriorate if they are not used“ . If the operator must take over after unusual system behaviour, he might not have much experience in manually handling the system anymore. This, in turn, can increase the time-delay and control gain (in case of manual control tasks) of the operator’s response, and lead to longer decision times or “worse” responses. Complicating things further, situations that require human intervention will most likely be abnormal situations which the automation couldn’t handle anymore, requiring not only nominal system control capabilities, but the ability to control the system while it shows abnormal behaviour. “(…) An operator will only be able to generate successful new strategies for unusual situations if he has an adequate knowledge of the process” . Long-term knowledge retrieval is dependent on frequent use. As the operator is only expected to take over control in rarely occurring unusual situations, he might lack enough opportunities to employ his knowledge, hindering his capability of retrieving his knowledge efficiently. In addition, an operator with mainly supervisory responsibilities will seldom have opportunities to build up a knowledge basis about the system behaviour. Therefore, the operator’s ability to build up, as well as the ability to employ his system knowledge might be impaired by introducing automation. In addition to long-term knowledge storage, the operator of a complex system keeps short-term system characteristics and system states in working storage memory. This knowledge is used to make predictions about future control actions and their effects. “This information takes time to build up. The implication of this (…) is that the operator who has to do something quickly can only do so on the basis of minimum information” . After taking over from automation, the operator will need some time to acquire knowledge of the system state. Humans are not built for the task of monitoring a system. “Vigilance” studies show “(…) that it is impossible for even a highly motivated human being to maintain effective visual attention towards a source of information on which very little happens, for more than about half an hour” . Trying to solve this problem by introducing automated alarms only shifts the problem one level higher (“who monitors the alarm system?”). When automated systems run long enough without incident, it might also induce “automation complacency”, the tendency to trust the automated systems even in situations where human intervention is necessary. In addition, in cases where the automated system outperforms the human operator in nominal conditions, it can be hard for the human operator to distinguish between appropriate system behaviour and abnormal states. It might be hard for him to understand the system’s actions: in nominal conditions, it performs the task at hand “better”, possibly taking more input data or system dynamics into consideration than the human operator can. Introducing automation will affect the skills and tasks of the human operator, but it might also impact his satisfaction with the task at hand and his health. It can be hard for operators to build up and maintain their manual control skills if they are not used (anymore). This can lead to situations as described by , where fast process dynamics, a high frequency of actions and inadequate skills/options to control the system correspond to high stress levels, high workload levels and poor operator health. Several “ironies of automation” must be considered while designing automated systems. Inducing automation complacency, vigilance problems or a degradation of piloting skills should be avoided. The existence of these issues warrants the analysis of human-automation interaction in the helicopter domain, to enable the development of resilient and effective automation systems that reliably support the pilot, ideally also in unanticipated situations and emergencies. G. Baxter, J. Rooksby, Y. Wang, and A. Khajeh-Hosseini, “The ironies of automation: still going strong at 30?,” in Proceedings of the 30th European Conference on Cognitive Ergonomics – ECCE ’12, 2012, p. 65. B. Strauch, “Ironies of Automation: Still Unresolved After All These Years,” IEEE Trans. Human-Machine Syst., pp. 1–15, 2017. C. L. Ekkers, C. K. Pasmooij, A. A. F. Brouwers, and A. J. Janusch, “HUMAN CONTROL TASKS: A COMPARATIVE STUDY IN DIFFERENT MAN—MACHINE SYSTEMS,” in Case Studies in Automation Related to Humanization of Work, Elsevier, 1979, pp. 23–29. 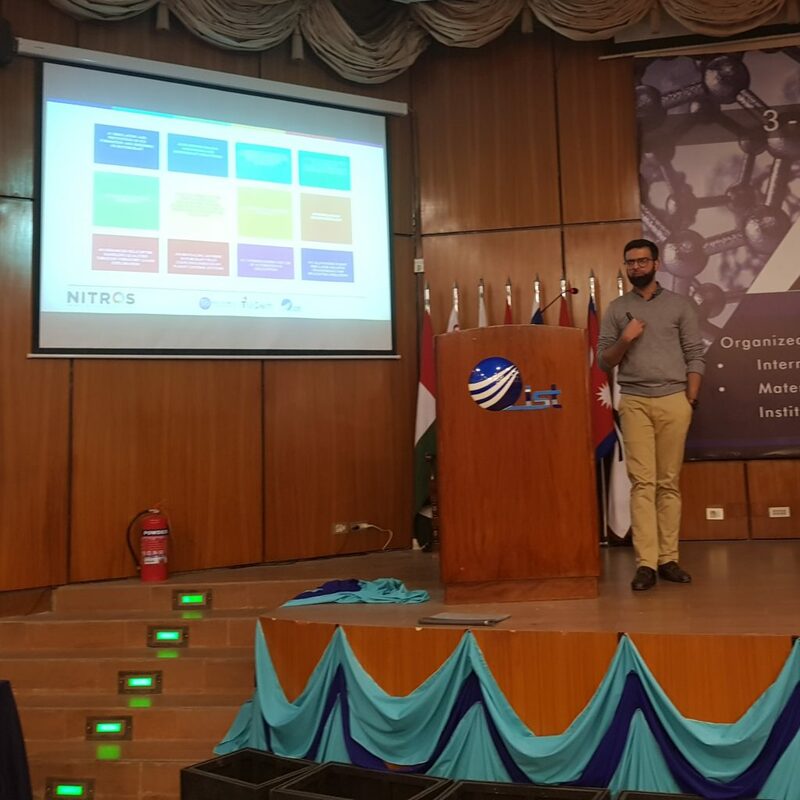 This is the first released media prepared to present the objectives of NITROS Network. Thanks to Myles Morelli who made this short video.